1. Discovered a can of pureed pumpkin in the back-crack corner of the pantry. 2. 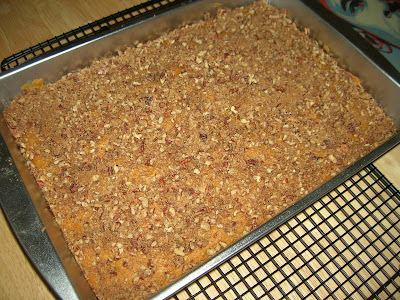 Found this Pumpkin Crumb Cake Pecan Streusel in the V'con. (I've flipped through that book a ton, but I never saw it before). 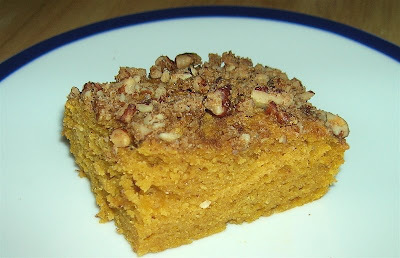 It was an awesome dessert that filled my kitchen with the spices of late fall. Yesterday also was a really good day for repairs. The TG crew finally fixed my sink (I didn't have a functioning hot water faucet for about a month). After several attempts (mine and the repairmen) they accepted failure and ponied up some coin for a new faucet (I'm easily excited — spray attachment!). Speaking of TG, neighbor and Tribster J.B. has a blog dedicated to Downtown Waco living. Check it out. e-mail me when you get a chance. jason_hunter -at- alumni -dot- utexas -dot- net.